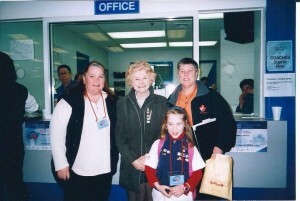 In 2004 I got the chance to meet Agnes Jacks during Nationals when they were here in Calgary. Even though I don’t remember too much from then I defiantly remember getting to meet Agnes Jacks. My aunt would drive Agnes around during Nationals and because my dad was volunteering for security my mom and I went to watch Nationals. It really was an amazing experience and I’m glad that I got a chance to meet her. This entry was posted in Blog Posts, Ringette and tagged in meeting Agnes Jacks, play it love it live it, ringette, ringette since 1963, since 1963, team sport, the fastest game on ice, throwback thursday.